The Unscented Kalman Filter block estimates the states of a discrete-time nonlinear system using the discrete-time unscented Kalman filter algorithm. 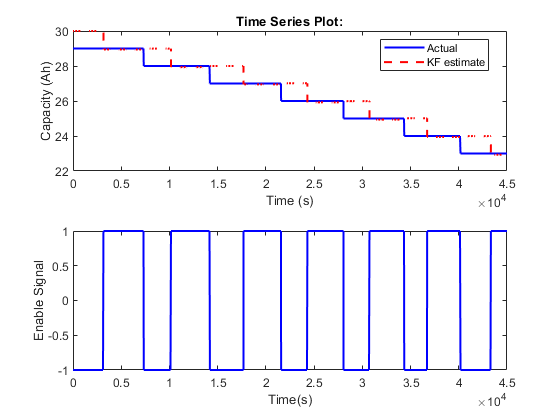 Using the state transition and measurement functions of the system and the unscented Kalman filter algorithm, the block produces state estimates x^ for the current time step. For information about the algorithm, see Extended and Unscented Kalman Filter Algorithms for Online State Estimation. You create the nonlinear state transition function and measurement functions for the system and specify these functions in the block. 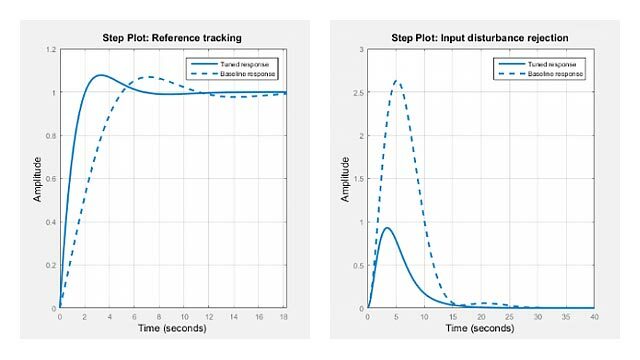 The block supports state estimation of a system with multiple sensors that are operating at different sampling rates. You can specify up to five measurement functions, each corresponding to a sensor in the system. For more information, see State Transition and Measurement Functions. If your state transition function has more than one additional input, use a Simulink Function block to specify the function. When you use a Simulink Function block, you provide the additional inputs directly to the Simulink Function block using Inport blocks. No input ports are generated for the additional inputs in the Unscented Kalman Filter block. If your measurement functions have more than one additional input, use Simulink Function blocks to specify the functions. When you use a Simulink Function block, you provide the additional inputs directly to the Simulink Function block using Inport blocks. No input ports are generated for the additional inputs in the Unscented Kalman Filter block. If you are using a Simulink Function block, specify x and w using Argument Inport blocks and the additional inputs Us1,...,Usn using Inport blocks in the Simulink Function block. You do not provide Us1,...,Usn to the Unscented Kalman Filter block. The unscented Kalman filter algorithm treats the state of the system as a random variable with a mean state value and variance. To compute the state and its statistical properties at the next time step, the algorithm first generates a set of state values distributed around the mean value by using the unscented transformation. These generated state values are called sigma points. The algorithm uses each of the sigma points as an input to the state transition and measurement functions to get a new set of transformed state points and measurements. The transformed points are used to compute the state and state estimation error covariance value at the next time step. Alpha — Determines the spread of the sigma points around the mean state value. Specify as a scalar value between 0 and 1 (0 < Alpha <= 1). It is usually a small positive value. The spread of sigma points is proportional to Alpha. Smaller values correspond to sigma points closer to the mean state. Kappa — A second scaling parameter that is typically set to 0. Smaller values correspond to sigma points closer to the mean state. The spread is proportional to the square-root of Kappa. Characterization of the state distribution that is used to adjust weights of transformed sigma points, specified as a scalar value greater than or equal to 0. For Gaussian distributions, Beta = 2 is the optimal choice. For more information, see the description for Alpha. Spread of sigma points around mean state value, specified as a scalar value between 0 and 3 (0 <= Kappa <= 3). Kappa is typically specified as 0. Smaller values correspond to sigma points closer to the mean state. The spread is proportional to the square root of Kappa. For more information, see the description for Alpha. The software generates an additional input port MeasurementFcnInput to specify this argument. If you are using a Simulink Function block, specify x and v using Argument Inport blocks and the additional inputs Um1,...,Umn using Inport blocks in the Simulink Function block. You do not provide Um1,...,Umn to the Unscented Kalman Filter block. 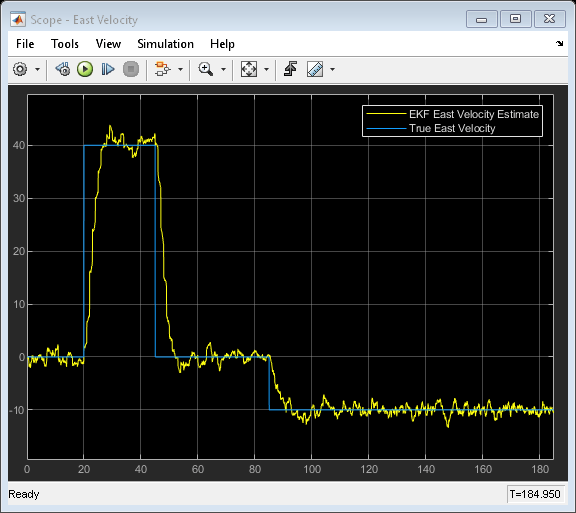 The state transition and measurement functions that you specify must use only the MATLAB commands and Simulink blocks that support code generation. For a list of blocks that support code generation, see Simulink Built-In Blocks That Support Code Generation (Simulink Coder). For a list of commands that support code generation, see Functions and Objects Supported for C/C++ Code Generation — Category List (MATLAB Coder).